History: Mission is the latest name of the Bellevue Public Schools building located on the northwest corner of Mission Avenue and Washington Street. Built in 1869, it was known as Bellevue School District #1 until 1911, when it was renamed Main School. In the early 1950s, the school became known as Bellevue Junior/Senior High School and educated students grades 7-12. In February 1962, when the new Bellevue Senior High school opened for grades 10-12, the school was again renamed to Bellevue Junior High School for grades 7-9. When a second junior high was built in 1966, students helped name the two buildings by sending recommendations to the Board of Education. Bellevue Junior High School became Mission Junior High School and later Mission Middle School. The name Mission honors the first school built in Bellevue by the Presbyterian Board of Missions in 1846 serving Omaha, Pawnee, and Otoe children. When the Omahas sold their land to the federal government in 1854, they gave one square mile of land in present day Bellevue to the Presbyterian Board of Missions. 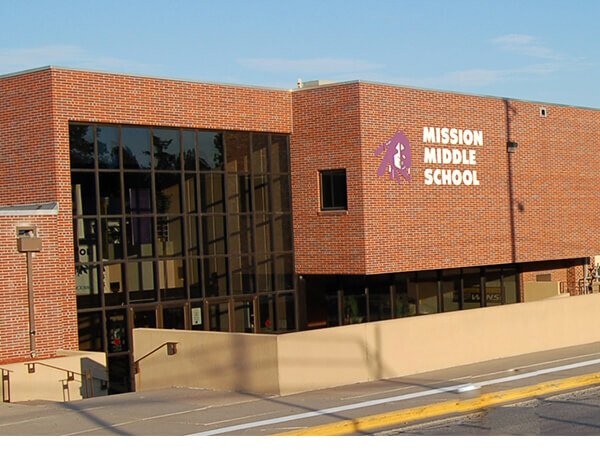 Mission Middle school is located on this historical Mission Reserve. School Purpose: Mission Middle School commits to being an exemplary school by operating as a CLASS ACT, doing whatever it takes to ensure that our students reach their highest level of success. As part of the bond work scheduled in the District, one of the items scheduled for replacement place the existing bleachers in the gym at Mission Middle High School. The new seating will replace the existing wood bleachers with new retractable contoured plastic bench seats. Work on the installation of the new bleachers were completed just prior to the end of the year and are in full use. The Bellevue School District is looking at completing renovations to the existing track at Mission. The track at the school was omitted from the initial proposed bond work, but in review of existing conditions, it was determined that the condition of the track was actually in worse condition than the other middle school tracks in the District. Engineering plans are currently being prepared to replace the existing asphalt track with a new asphalt track with miscellaneous revisions around the track. Bids will be received in mid-March for consideration by the Board in April 2019. The Bellevue School Board approved at the May 2018 meeting a contract with Heartland Seating to replace the existing bleachers in the gym at Mission Middle School. The new seating will replace the existing wood bleachers with new retractable contoured plastic bench seats. Work is tentatively scheduled to start shortly after September 1st, 2018 and will be completed in the Fall of 2018. The Bellevue School Board is looking at completing renovations to the existing track at Mission. Some preliminary options were discussed at the May BPS Board meeting and it appears that there is a possibility of the track receiving a new rubberized surfacing material. Plans will be prepared and put out to bids to determine final costs and will be presented to the Board possibly in June of 2018. Also occurring at Mission in 2018 is the scheduled replacement of the existing bleacher systems within the main gym area. The Bellevue School Board approved at the May 2018 meeting a contract with Heartland Seating to replace the existing bleachers in the gym at Mission. The new seating will replace the existing wood bleachers with new retractable contoured plastic bench seats. Work is tentatively scheduled to start shortly after September 1st, 2018 and will be completed in the Fall of 2018. The Bellevue School Board approved at the May 2018 meeting a contract with Heartland Seating to replace the existing bleachers in the gym at Mission Middle High School. The new seating will replace the existing wood bleachers with new retractable contoured plastic bench seats. Work is tentatively scheduled to start shortly after September 1st, 2018 and will be completed in the Fall of 2018.